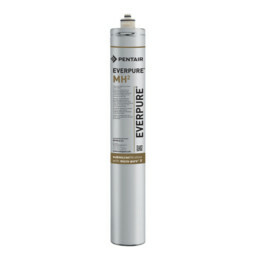 WaterCare stock an extensive range of Pentair Everpure professional water filter cartridges, filter heads and fittings. Since 1933, Pentair Everpure has been one of the most trusted global brands in the foodservice industry and those who serve it. Their proven solutions help to protect water at your home and where you work. For product specifications, download brochure below. 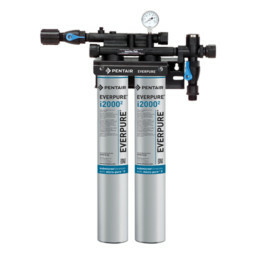 The Everpure Insurice filtration system provides premium quality water for ice machines and flakers. It reduces chlorine taste, odours and other contaminants for clearer, brighter great tasting ice. Proprietary Micro-Pure® II filtration media effectively inhibits the growth of bacteria on the filter. Sanitary cartridge replacement is simple, quick and clean. Internal filter parts are never exposed to handling or contamination. The filter also reduces water related ice machine service problems caused by scale, dirt and other dissolved minerals. Applications: For ice machines and flakers. The Everpure MH2 provides premium quality water for coffee and hot beverage applications. Ensures clear, fresh water that produces great tasting coffee and other hot beverages. Scale inhibitor helps reduce scale build up on heating elements thus protecting the equipment and reducing service costs. Activated carbon filter reduces chlorine taste and odour. Proprietary Micro-Pure II filtration media effectively inhibits the growth of bacteria. The Everpure MC2 provides premium quality water for water coolers and fountains. Ensures clear, fresh water that produces great tasting fresh water. Reduces chlorine taste and odour and other contaminants. Applications: For drinking water applications. 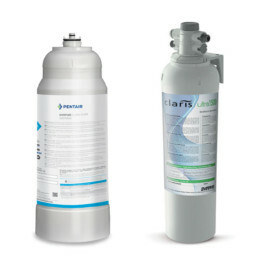 Everpure Claris filter systems are designed specifically for tea and beverage equipment. The cartridges reduce scale as well as improving the taste and aroma of the final beverage. The Claris system uses ion exchange (saltless softening) technology to remove hardness and reduce alkalinity. The final water hardness can then be carefully tailored for optimal performance. The Everpure Claris ULTRA systems have all the same benefits of the above but also features a process that combines softening plus sequestering which stabilises the mineral content of the water. This means that the final water is close to neutral on the pH scale which further helps prevent scale formation. Both types of cartridge are available in different sizes to match the approximate volume of water to be treated for great tasting beverages and peace of mind. In addition the Claris XXL System is suitable for steam applications. Applications: For coffee and vending machines.